The AL055 is an economically priced inside lift that is designed to be as convenient as possible. The AL065 is an innovative, one-of-a-kind lift that mounts to the hitch on the outside of the vehicle, but loads the power chair or scooter inside the vehicle! The AL215 is an efficient and economical solution for transporting smaller, lighter power chairs and scooters. 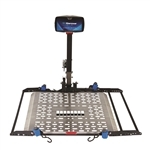 The AL425 is a premier inside, boom-style lift that offers a 400 pound capacity. The AL435 powered boom can maneuver the largest possible power chairs and scooters into the smallest vehicle openings.